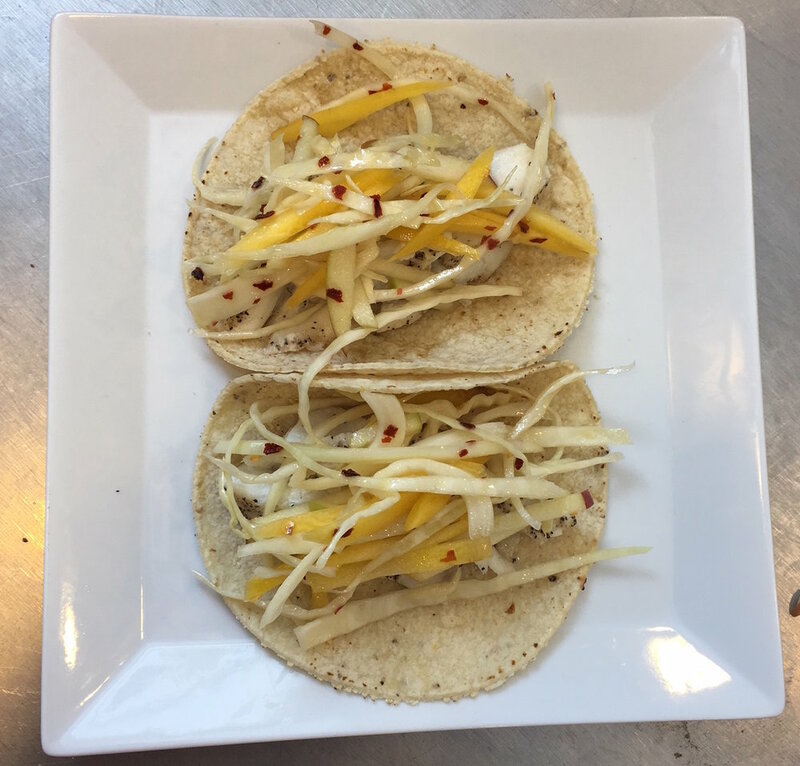 There are just a few simple steps to creating these delicious fish tacos with our Omnivore Package from this week. 3) Heat your tortillas and assemble your tacos, topping with slaw and/or sunflower shoots, and hot sauce if you'd like! We used one fillet for 2-3 tacos. Use 2 fillets to serve 4-6 tacos. If you have time, you can let the cod thaw in the refrigerator - for example, put your cod in the fridge for the day while you're out so that it thaws in time for dinner. However, the Wild Alaska Seafood organization, with great recipes and cooking tips, says it's OK to cook your fish frozen - though you will need a few more minutes to cook it. We seasoned the cod with a generous amount of salt and pepper on both sides. Heat about 1 tbsp of oil in a pan over medium heat. It's ready when you can see a slight shimmer in the oil. Place the cod fillet in the pan. Let it cook for 3-5 minutes. Flip, and allow to cook for an additional 3-5 minutes on the second side. It will be done when it starts to flake into sections and has an opaque white color all the way through. Then, we sliced the cabbage into very thin slices, around the same size as the carrot matchsticks, so that they'll absorb the dressing and be easy to add on top of the tacos. Stir together the dressing ingredients and coat the sliced veggies well. Season to taste - if you want it more spicy, add more red pepper flakes. If you want it to be more tangy, add more vinegar, etc. Place one tortilla on the pan, let one side warm, then flip it over, and let the other side warm. Add the second tortilla to the pan, and repeat. Place tortillas on the plate, then add pieces of cod. Finally, top with sunflower sprouts and/or your favorite hot sauce for some extra color and texture.